Plants annual. 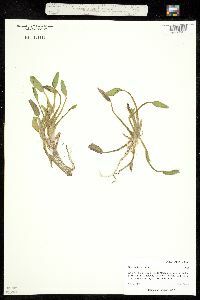 Vegetative stems submersed with elongate inter-nodes only on plants in over 5 cm of water, or emersed and short. Flowering stems 2-24 cm, distal internode 1-11 cm. Sessile leaves forming basal rosette, blade linear to oblanceolate, thin or sometimes thickened, 3.1-6 cm × 3-5 mm. 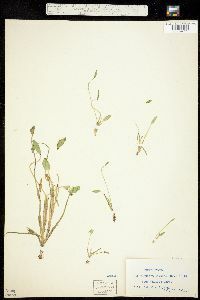 Petiolate leaves emersed; stipule 1-6 cm; petiole 2-13 cm; blade oblong to ovate, 1-5 cm × 4-33 mm, length equaling or greater than width; base truncate to cuneate, apex acute. Inflorescences 1-flowered; spathes 0.9-4.5 cm, glabrous. Flowers opening within 1 hour after dawn, wilting by midday; perianth blue or white, salverform, tube 15-44 mm, limbs essentially actinomorphic, lobes equal, narrowly elliptic, 5.2-26.3 mm, distal lobes yellow toward base; stamens unequal, lateral stamens 2.3-7.8 mm, central stamen 3.3-7.2 mm; filaments linear, glandular-pubescent; style glabrous. Seeds 9-14-winged, 0.5-0.8 × 0.2-0.6 mm. 2n = 14. Flowering May--Nov. Shallow water or emersed at pond edges and in roadside ditches; 0--2000 m; Ariz., Ark., Calif., Colo., Fla., Ill., Iowa, Kans., Ky., La., Miss., Mo., Nebr., N.Mex., Okla., S.Dak., Tenn., Tex. ; Mexico; West Indies; Central America; South America (Argentina, Bolivia, Brazil, Colombia, Ecuador, Paraguay, Venezuela). 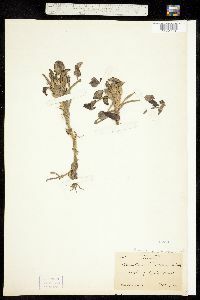 Personal observation of Heteranthera limosa suggests that it is best adapted for growth in water less than 5 cm deep and is a poor competitor with the closely related H. rotundifolia in deeper waters. Plant: annual aquatic herb; vegetative stem submersed with elongate internodes, or emersed and short Leaves: few, submersed, thickened, green on abaxial surface, linear to oblanceolate, obtuse at apex; petiolate leaves emersed, oblong to oval, cuneate to truncate at base, acute to obtuse at apex, 1-5 cm long, the petiole rigid INFLORESCENCE: 1-flowered Flowers: perianth salverform, blue or white, the tube 15-44 mm long, the lobes narrowly elliptic, obtuse at apex, 5.2-26.3 mm long, the upper lobes yellow toward base; stamens of two sizes, the lateral stamens 2.3-7.8 mm long, with yellow anthers 0.9-3.3 mm long; central stamen 3.3-7.2 mm long, with a purple or white anther 1.3-3.9 mm long; mature pollen remaining in tetrads Fruit: an elongate capsule with longitudinal dehiscence. SEEDS many, 0.5-0.8 mm long, the testa with longitudinal wings and cross striae between wings Misc: Ponds and ditches; up to 1500 m (4500 ft.); Mar.-Sep. REFERENCES: Horn, Charles N. 1998 Pontederiaceae. J. Ariz. - Nev. Acad. Sci. 30(2): 133. Aerial lvs emersed, the blade 1-5 cm long and about half as wide, oblong to ovate, acutish, with cuneate to truncate base; petioles to 1.5 dm; spathe folded, abruptly caudate-acuminate, 1-4.5 cm, enclosing 1 fl; fls purple to white, the perianth-tube 1.5-4.5 cm, the lobes 5-15 mm, about equally spreading, the 3 upper ones basally yellow; stamens subequal, with straight filaments, the lateral ones yellow, the central one purple or white; style glabrous; 2n=14. In shallow water at the edges of ponds and ditches, or wholly emersed on mud; Mississippi R. drainage from Ky. to Io. and S.D., s. to S. Amer. ; also Calif. to Ariz. and w. Mex.